The Xiaomi Budget range Flagship Redmi Note 5 Pro, Best in the Note 5 series launched a few months ago with Nougat out of the box and with Miui skin. The high demand for this device has created such a mess that now you have to pay nearly 1k extra from the Original launched price. Xiomi phone generally has the great number of Developers and tester behind them result in that we have got Official TWRP within few months also there was Unofficial Twrp available after the few weeks. Also Enable the USB Debugging On your Redmi Note 5 Pro, go to Settings > About Phone and tap on the MIUI version 7 times. Developer options can now be found in Settings > Additional settings. 1- Connect your device to the computer and Open Command prompt on windows by using Windows key + R and type "cmd" press enter. 2-Now to reboot your phone into the Fastboot mode using this ABD command or also by pressing Power and Volume down key we can go to fastboot mode. 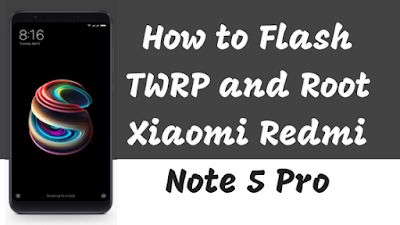 3- Once in fastboot mode, flash the TWRP image you downloaded earlier. 4- Now Reboot the Device in twrp. That's it.You have now flashed TWRP. Navigate to and select the downloaded Magisk or SuperSU zip file and select it. Swipe at the bottom to flash the zip. When it is done, you will see a Reboot system button at the bottom, tap on it and your device will reboot. Bhai samjh nhi aaya WhatsApp no do apna aap mere is no pay msg kr do yrrr 8092506498.